As you keep using your car navigator, you will notice that maintaining its brand-new look can be a time consuming chore. Overtime, it will cover with fingerprint smudges, dust, scratches, or in the worst-case, an accidentally spilling liquid or a small scratch of a ring that last the life of the screen. But don't fret! We have a perfect solution to preserve the mint condition of your GPS navigator! What Makes ♥RUIYA Car Navigation Screen Protector♥ Become Amazon's Best Slling? ✔ Crisp and clear visuals, comfortable touch feeling guaranteed! ✔ Anti fingerprint, anti scratch, anti-explosion and anti-oil. ✔ Perfect 0.25mm thickness. Maintain the mint condition of the navigation screen without sacrificing its touch capabilities while improving its smoothness and clarity. ✔ Made from high-end scratch resistant surface polymer and layered with oleophobic coating to make it resistant to fingerprint smudges. ✔ No residue will be left on the navigation screen when you remove the cover. ✔ If the screen protector becomes oily or dirty, simply wipe the surface with microfiber cloth and it'll look brand new again No harmful cleaning substances! It is suitable for the 2014-2018 Jeep Wrangler 6.5-Inch. ★NO MORE FINGERPRINT SMUDGES. Layered with an oleophobic coating that repels oil left from your fingerprints and adds an additional smoothness to the navigating screen. ★LASER CUT FOR PRECISE FIT. 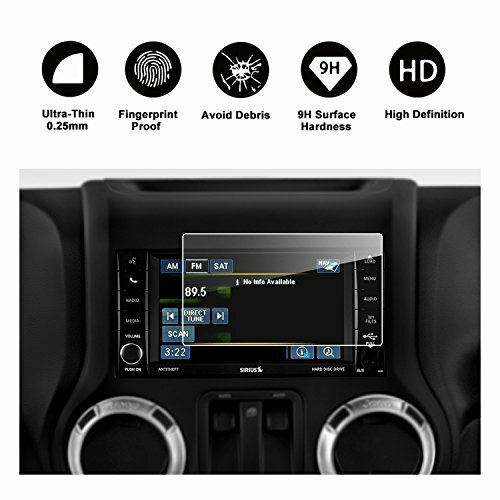 No need to trim the edges, as it is compatible with the GPS navigators of 2014-2018 Jeep Wrangler 6.5-Inch. ★ENJOY HASSLE-FREE CLEANING. To keep your GPS screen protector clear and dust-free, simply wipe it with a microfiber cloth. No need to use harmful cleaning substances. If you have any questions about this product by R RUIYA, contact us by completing and submitting the form below. If you are looking for a specif part number, please include it with your message.